Slow zoom to The Houses of Parliament, also known as The Palace of Westminster. The Westminster Bridge is seen here as well as the famous clock tower of Big Ben which is an iconic landmark of London. 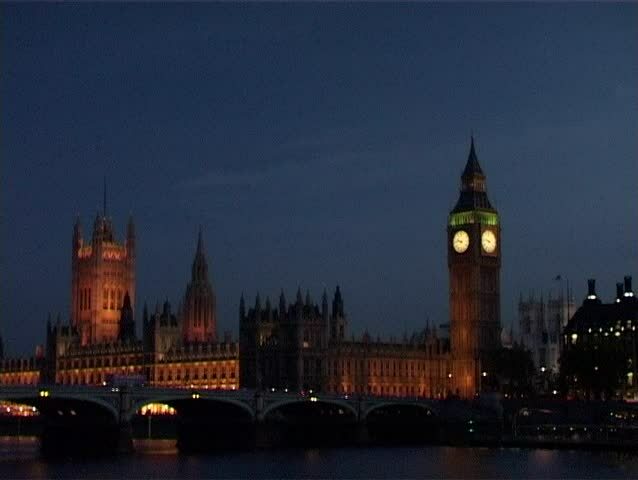 4k00:154K video footage of the iconic Big Ben clock tower illuminated against a dusky sky; after a few moments the camera pans to the left passing over the Palace of Westminster. 4k00:21Westminster, Houses of parliament and Big Ben, London, England by night. 4k00:12Night view of Westminister bridge, Big Ben and Houses of Parliament, London, England, 4k. hd00:11A sequence of stop-motion video of traffic in front of British Parliament (Palace of Westminster) with a view on Big Ben. 4k00:17LONDON - MAY 23: Buses, cars and pedestrians cross Westminster Bridge at night with Houses of Parliament in the background on May 23, 2015 in London. The Palace of Westminster is a UNESCO site.